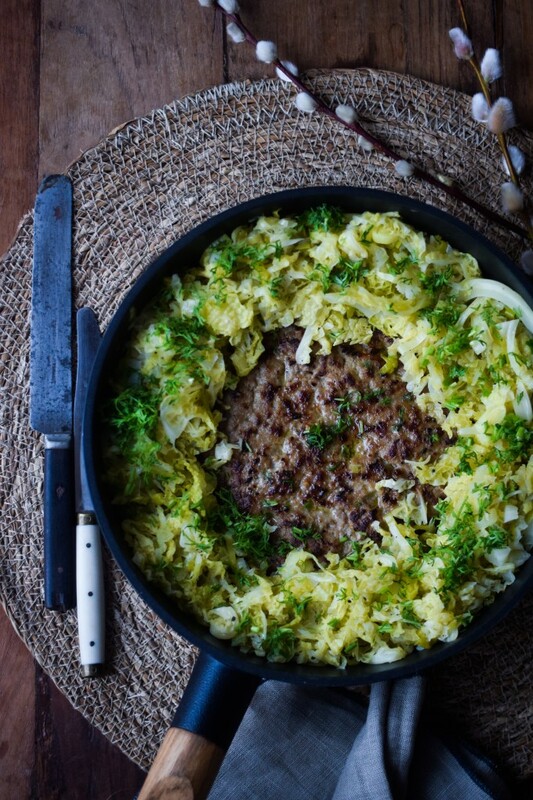 This skillet meatloaf is a good old traditional Danish recipe that was extremely popular in the 80’s and early 90’s. Then we seem to have forgotten it. That’s a shame because it’s really really a good recipe and best of all it brings back so many good memories from my childhood in the 80’s. My mom used to make this one and many other classics and I’ve decided to give them all a boost here on my blog. They deserve it. They are that good! I love recipes like my many quinoa recipes, my pizza with cauliflower crust and my healthy cookie dough bites recipe but nothing beats going down food memory lane and make the recipes from your childhood. Don’t you feel the same way? So here you go! A good old Danish classic. 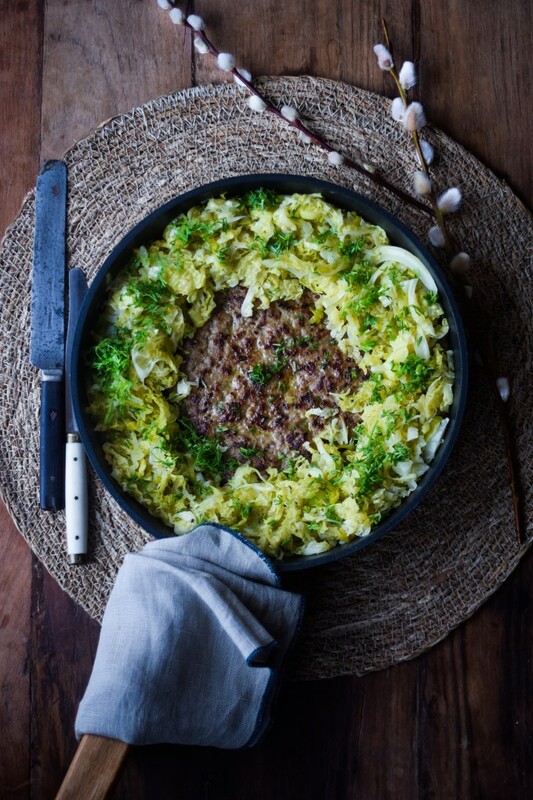 Skillet meatloaf with butter sauteed savoy cabbage and leeks and lots of fresh herbs. Yum! An old Danish classic. 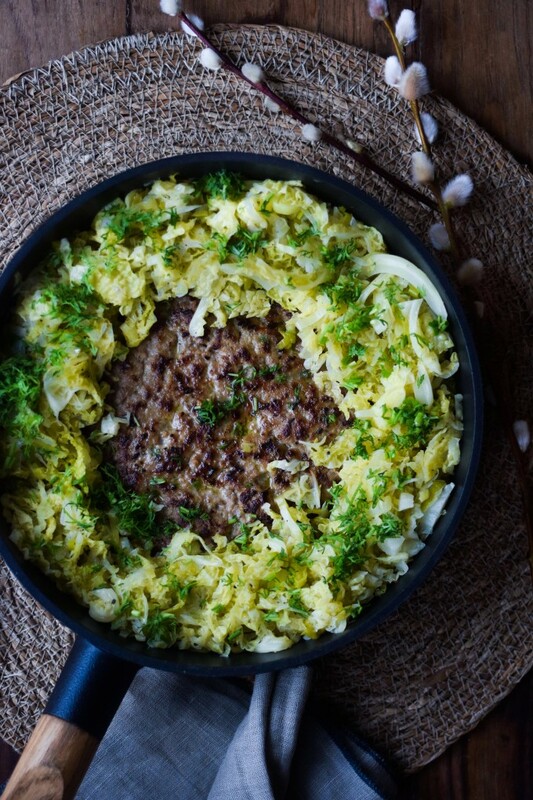 You got to try this amazing traditional skillet meatloaf. So easy, and so good! Start preparing the vegetables. Rinse and cut cabbage and leeks into thin slices. Bring them to a pan with butter and let it fry for a couple of minutes. Add water and let it simmer for 10-15 minutes with a lid on. Finely grate the onions and put it in a bowl with the minced meat and the other ingredients. Stir together into a fine mass. Heat butter on a pan and spread the meat onto the pan like a pancake. Fry on medium heat on both sides until it is done. Info! I turn the skillet meatloaf with a large pot lid, so it does not risk breaking. Add salt to the sauteed cabbage if needed and lots of freshly ground pepper and place the cabbage on the meatloaf. Sprinkle with lots of fresh herbs and serve!